Escape to Ramoji Film City, a magical realm filled with excitement and wonderful surprises at every turn. As the world’s largest integrated film city and India’s only thematic holiday destination with magic of cinema, there’s something special for you here. 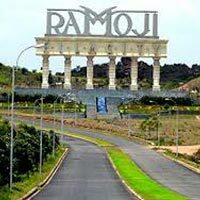 Spread across a sprawling 2000 acres Ramoji Film City, set up by Ramoji Group in 1996, is a dreamy celluloid journey. Certified by the Guinness World Records as the world’s largest Filmstudio complex, at Ramoji Film City, a filmmaker can walk with a script and walk out with film. For the others, Ramoji Film City flung open a wonderland where 1.5 million tourists build memories every year.